87 percent of surveyed businesses reported using telephone conferencing, with 60 percent seeing conference call usage escalate over the past year. 59 percent of workers had spent more time on conference calls than a year ago. 56 percent of global CFOs said they would invest in video conferencing to reduce their travel needs. As a result of these trends, the market has seen a reduction in the cost and complexity of virtual tools, and the rapid emergence of a dizzying array of unified collaboration technologies— from videoconferencing hardware and distributed audio to soft codecs such as Skype and FaceTime. With AV and IT technologies becoming ever more tightly intertwined, one of the more persistent challenges is the need for closer, richer collaboration between AV and IT technical staff. The push for virtual collaboration places a number of demands on organizations. One demand is the need to employ technology that can simulate authentic in-person interactions using existing infrastructure. Another is the need to nurture the culture of the organization in order to implement new virtual collaboration requirements. Office spaces now need to be designed to accommodate the daily needs of virtual teams, and audio solutions must be deployed to deliver quality sound for specific and unique environments. Integrating AV systems into existing IT infrastructures can help deliver on virtual collaboration’s promise of increased productivity by improving data transfer and the flow of communication, but the everyday technology hurdles in collaboration are numerous. Interrupted calls and poor sound quality make it difficult for virtual teams to hear and understand information being exchanged, thus affecting team rapport. Teams also deal with lost time from system setup or dialing in, waiting for participants, and making any potential adjustments to ensure the ideal surroundings for the smooth flow of conferencing. In addition, popular software platforms hinder the effectiveness of virtual collaboration, since calls made with soft codecs are at the mercy of bandwidth limitations and low-quality input/output hardware. A single mobile participant can throttle the bandwidth for all other endpoints. in layer two. In 2011, the IEEE published the 802.1BA standards for Audio Video Bridging (AVB), a set of ratified standards that augment Ethernet protocols and allow data traffic and media traffic to be intelligently and dynamically managed depending on bandwidth needs. This reduces the IT issue of network over-provisioning, ensuring that businesses can purchase exactly how much bandwidth they need. In addition, AVB switches will enforce rigid barriers in bandwidth between data and media such that traffic surges in one will not impede the other. AVB was also designed with scale in mind, allowing it to accommodate complex enterprise AV environments with dozens of meeting rooms and hundreds of endpoints. While managing the network falls under the IT department’s jurisdiction, it is the AV experts who work to enrich the shared experiences for colleagues. One of the primary ways they do this is through the creation of huddle rooms—small spaces where five or fewer people can go for both scheduled and ad hoc meetings. 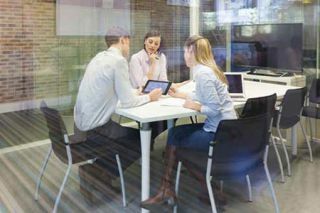 In addition to providing privacy from the common disruptions of open office settings, virtual meetings in these spaces offer advantages such as easier connectivity for extended work teams, reduction in travel costs, and increased overall productivity. In huddle rooms, sound is the most important— and most overlooked—factor affecting productivity. Noise, vibration, and audio distortion negatively impact people’s ability to concentrate, as well as their health and stress levels. This in turn negatively impacts virtual communication. There are several tools AV experts can use to enhance conferencing sound, including employing dedicated microphones to improve audio capture and separate loudspeakers for better comprehension. In addition, digital signal processing technology can help circumvent ambient noise pollution emanating from sources such as HVAC systems, while audio-enhancing innovations such as speech processing software and acoustic echo cancellation allow for more natural-sounding audio. Cooperation between AV and IT functions must start at the most fundamental level, with both parties closely involved in the initial design phase as well as in the network’s day-to-day operations. This means both, considering AV requirements when building the IT network, as well as using AV technologies to augment the system. In day-to-day operations, collaboration between the two works best when each discipline’s expertise is coordinated: IT manages network systems and AV experts work to enrich the shared experiences through the technology used. However, while it is important to define the specific components that each department will be responsible for, it greatly benefits both — and ultimately the organization — to learn from each other through cross-training. For example, AV staff should understand the capabilities and functions of selected soft codec solutions and settings in the operating systems used. At the same time, IT staff needs to understand how AV infrastructure and endpoints interact with existing hardware and software. Through this approach, IT and AV staff will effectively work together to deliver a single unified experience for users and increased productivity for the organization. Paul Waadevig is the Unified Communications product manager at Biamp Systems.